So it’s a pretty common thing for men to love technology. However, I need to admit that I’m also a fan. But in my family, my husband is THE tech guy. Like in all my family, which is extensive. Anytime anyone needs to buy a new computer or TV or something, they ask him first. And my husband loves his toys, so for his dental school graduation gift, I bought him his dream TV (at least the one that was reasonable to buy.) And I have to say, it is pretty awesome to watch TV on. It’s 60 inches, super thin, LED, with a very low wide base. And it even does 3D, even though I will never use it since I don’t want to wear those glasses. But my husband just LOVES it. He got a free sound bar with the purchase, but the problem was that since our TV sits on a console that is kind of low, if we set the soundbar in front of the TV, the kids would inevitably ruin it very quickly. It has some very inviting holes to shove toys into. 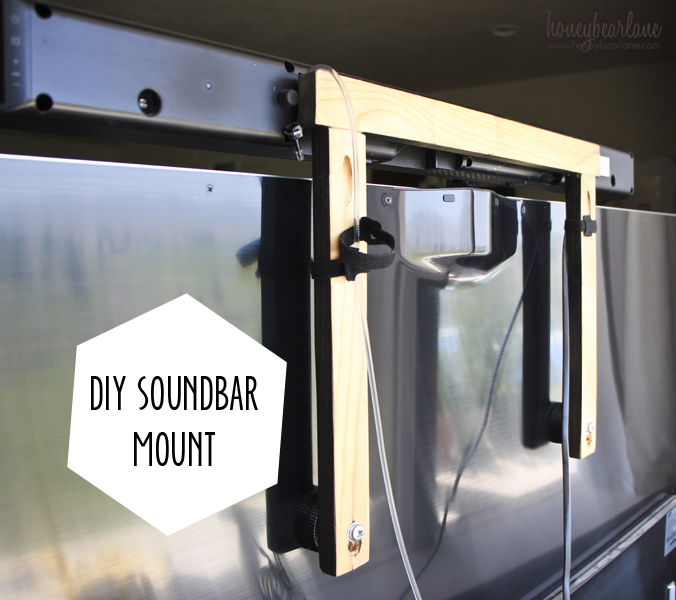 The ideal place for the soundbar was to sit above the TV, but sadly we haven’t learned the art of levitation, so we decided to put our Macguyver skills into play and make our own DIY soundbar mount. 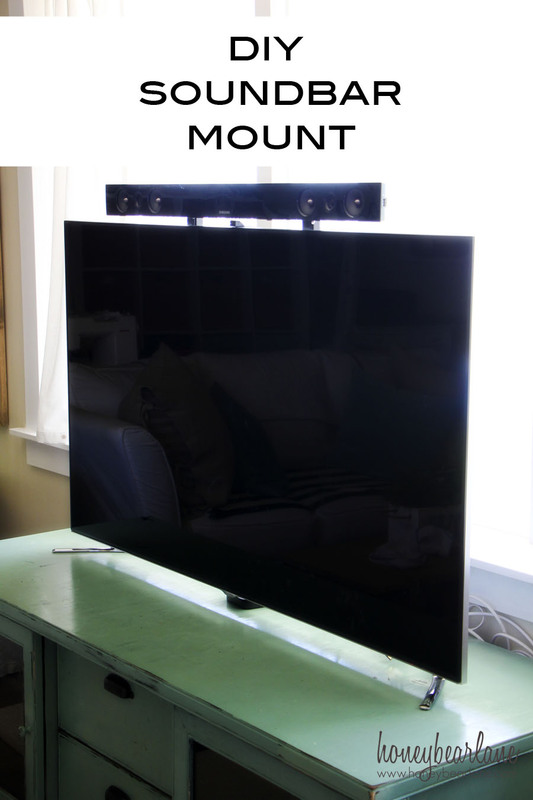 The TV has some holes in the back that are presumably for a mount that you would purchase, but all the ones to purchase were just not right for the space and super expensive. So why not make one out of wood? I simply screwed three pieces of wood together in a U shape, using a Kreg Jig. 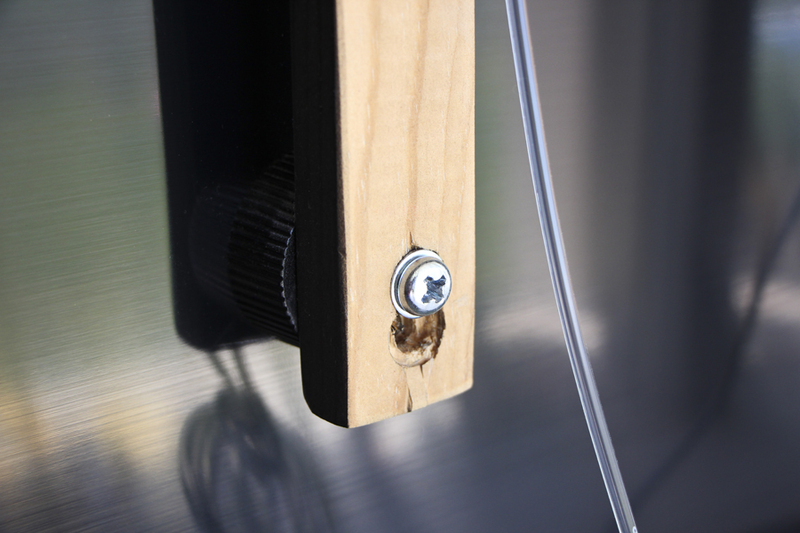 Then I drilled some holes (and it took a couple tries to get it right on as you can see in the pic below) and we used bolts to screw the wood into the TV. 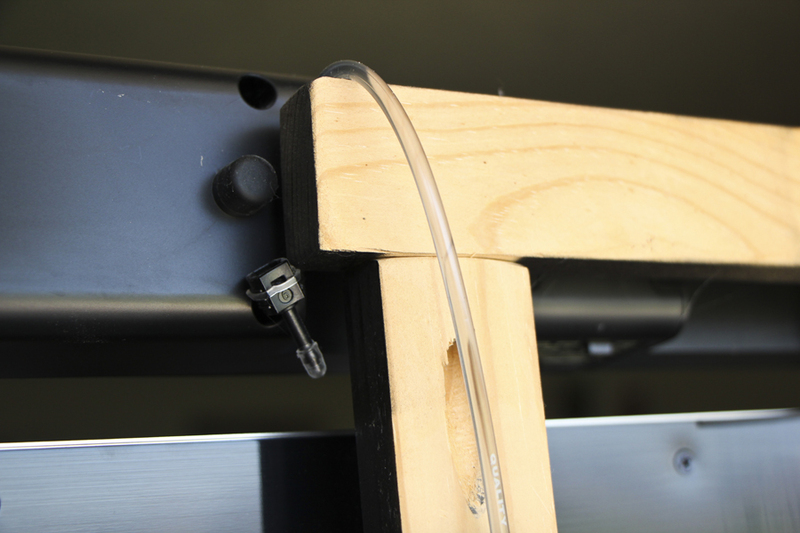 The soundbar has some places for hangers (think picture frame) so we just needed to place some screws that weren’t screwed in all the way in just the right spots so our soundbar would hang on the wood, like it would on a wall. This was done on the top piece. The added bonus of this was that my husband used some velcro ties to keep the wires behind the wood so you wouldn’t see them and it would be a nice, clean look. And of course we spray painted the entire front side black so it would just fade into the background and look like it was part of the setup. This was an easy project with a great payout. Now our soundbar is safe and away from kids’ fingers and toys, while also providing us with superior sound for our TV and movies. That sounds a little nerdy for a craft blog, but seriously, this is one of those little moments in life where a husband and wife can come together and make something awesome! (Not getting any less nerdy.) 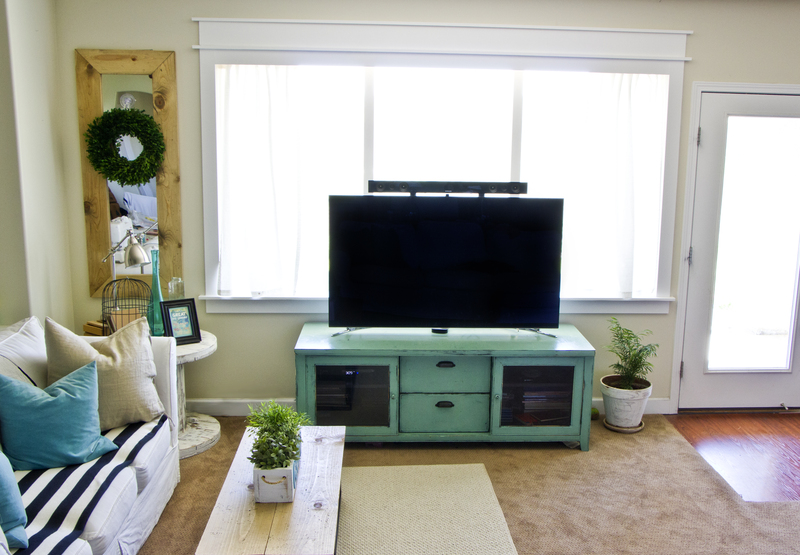 I have embraced the fact that our TV is just something that will be part of our decor. As much as I would love to lie and say we spend every evening reading books and engaging in intelligent conversation, the reality is this: Both of us, on the computer working with the TV playing movies or TV shows. Every night. It’s relaxing to me. In our new house, you’d better believe my husband is planning on making it a ‘smart’ house–decked out with tons of cool techy features. And this lovely television will have a place of honor above the fireplace. And it’s my job to figure out a way to make it seamlessly part of our decor. We have some big plans though…tech stuff doesn’t have to be this ugly mess of wires and black boxes, I think if it’s incorporated well, it can make a big impact. 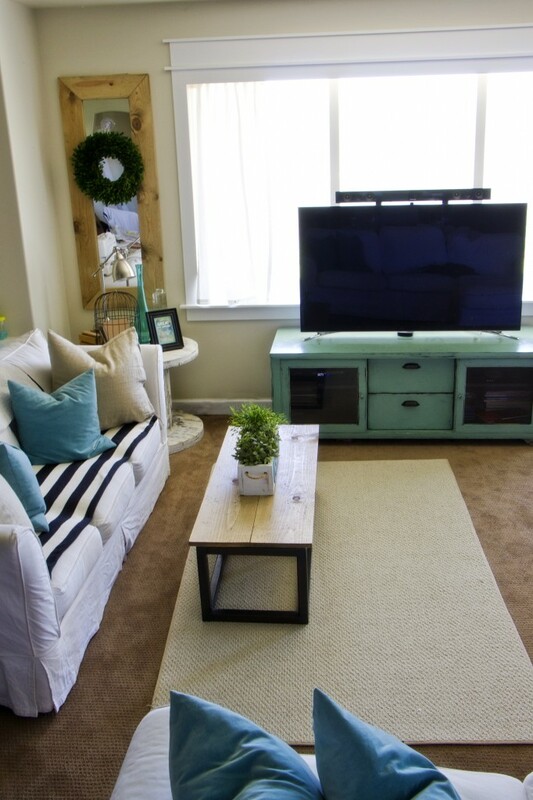 You can have the beautiful farmhouse style while still living in the 21st century! Now for your chance to win $4,500 from Verizon FiOS®! 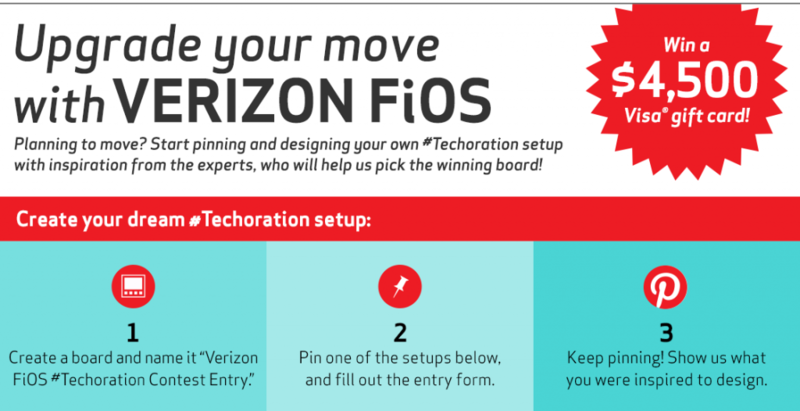 Here’s how to enter: Visit http://www.verizon.com/techoration. Then create a Pinterest board about #techoration– inspired by my post. Name it “Verizon FiOS #Techoration Contest Entry”. Pin your favorite setup on the site–check out the #Techoration inspiration hub by Verizon FiOS® (cough–Mine!–cough). Then pin other amazing #techoration that inspires you. Make it awesome, because the best board wins! Of all the boards created, they will narrow it down to 20, and I will help decide on the final winning board. Good luck! This is a sponsored conversation written by me on behalf of Verizon FiOS®. All opinions expressed are my own. I’ve actually been looking to increase the sound scape of my living room .. This seems like a great idea, I’ll definitely try it! It’s really been handy and we love it!